If you were Alice, would you rather stay in Wonderland on the other side of the mirror, or come back to the real world to tell your story? NO BRAINER – COME BACK AND TELL MY STORY. UNLESS THE MAD HATTER SERVED TACOS BY LEO (MY FAVORITE LA TACO TRUCK) AS HIS DAILY TEA SNACK; THEN IT’D BE A TOSS-UP. YES – AND ON KEY. What childhood fear do you still have as an adult? An author with whom you would like to have lunch? Do you wake up at night to read or write? ONLY WHEN MY DREAMS ARE BORING ME. Do you feel anxious or excited when you start to write? DEPENDS ON HOW PREPARED I AM. WHEN I’VE ALREADY WORKED OUT IN MY HEAD WHAT I’M GOING TO WRITE, I’M EXCITED TO WRASSLE WITH THE MOTHER TONGUE. Does darkness soothe you or frighten you? NEITHER – IT’S WHERE I LIVE, BABY. THINK WATER :: FISH. Does love dry up your creative juices or make them flow faster? DRIES ‘EM UP. ANYONE WHO SAYS OTHERWISE ISN’T REALLY IN LOVE. SOMETIMES – SEE ANSWER TO #5. TOO MANY ANSWERS, BUT HERE ARE A FEW SAMPLES: TO WEAR, BLACK. TO DRIVE, GREENISH KHAKI. TO DATE, THE FULL RAINBOW COALITION. IF IT COMES IN THE FORM OF A DEADLINE, YES. Would you rather live to write or write to live? I’VE DONE THE LATTER, AND IT MAKES YOU A HELL OF A LOT MORE GRATEFUL FOR THE FORMER. CAN YOU DO BOTH? I’M ON THE VERGE OF PULLING THAT ONE OFF NOW, I THINK. What published book do you secretly wish you had written? WHITE NOISE. AND NOT SECRETLY, EITHER. Are you the paranoid type or calm, cool and collected? What would qualify as the afternoon of your dreams? DRIVING MY CONVERTIBLE AROUND ALL MY FAVORITE NEIGHBORHOODS IN LOS ANGELES, ENDING ON THE BEACH. Are you more like the sun or the moon? DESPITE MY GLIB ANSWER TO #7, THE SUN. I’M ACTUALLY A PRETTY UPBEAT PERSON. EVERY WRITER SHOULD, AT TIMES. RIGHT? I’d like to thank David for taking time out of his busy life to participate in this blog post. I do have to wonder why he felt the need to yell at us. (Kidding) Here’s a little more about David and his poignant coming age novel Children of The Canyon. 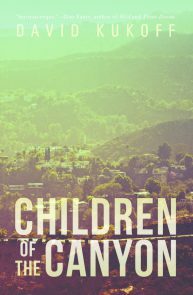 Children of the Canyon tells the story of David, a boy growing up in LA’s fabled Laurel Canyon neighborhood as the 1960s counterculture is coming to an end. David’s record producer father works with the reclusive former leader of a surf music band on an album that promises to elevate the legacies of both men to immortal status. His distant, peripatetic mother rides the waves of activism and feminism in and out of David’s life. The elusive Topanga, named for the city’s last remaining Eden, whom David meets on the beach the night of his parents’ separation continues to elude his futile attempts to reconnect with her throughout the decade. Through David’s eyes, we bear witness to the fallout from the California Dream’s malfunction: the ruined families, failed revolutionaries, curdled musical idealism, and, ultimately, the rise of the conservatism that put the country on its present path. Previous Beauty and the Self Conscious Beast.